Your van is so comfortable to ride in. Why shouldn’t your ride INTO the van be just as smooth? 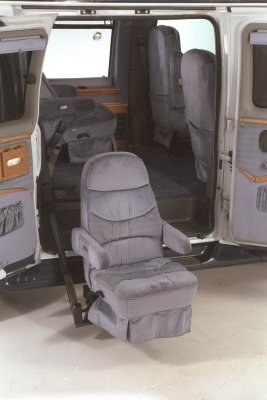 The Easy-Reach power lift seat provides a safe, short, comfortable ride into your minivan or full-size van. Because the Easy-Reach almost always uses the original vehicle seat, built-in safety sensors and your vehicle’s style both remain unchanged. In most cases you can still recline and even slide your seat! 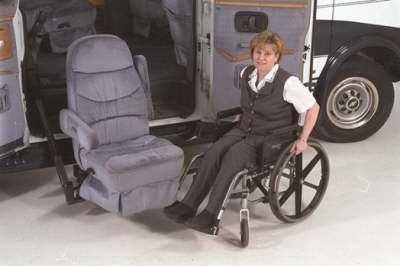 In the down position, the Easy-Reach faces more toward the rear than other power lift seats do, so you’ll have an easier time stowing your chair behind the seat of your vehicle. It’s easier to reach to the side than behind you! And if you’re using a scooter lift, the Easy-Reach brings you to a convenient spot to transfer to your scooter without interference from the door.